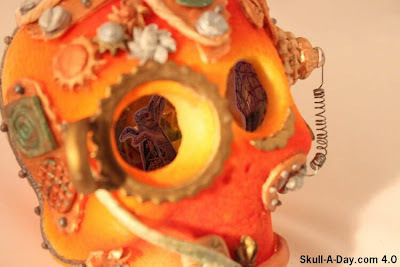 Eike Beck at Designers Skulls is once again looking for the best skulls in the world for his Skull of The Year contest! I was last year's winner and this year I will be a guest judge! There's no fee to enter, work of any style is accepted, and there's an awesome trophy up for grabs, so there's no reason not to submit your work! The deadline to enter is December 31st and more details about the contest can be found HERE (in German and English). The land of 1,000 lakes, or better known as Minnesota, is where Valerie Mikelson applies brush to canvas to bring us this 18x24 acrylic painting. Great skull, Valerie. The blues paints give this piece a chilly feeling. Almost as if we're looking at Iceman's skull. The warmer red colors could possibly represent the heat that finally melted the icy exterior of the super hero. At least that's my view...how do you see it? 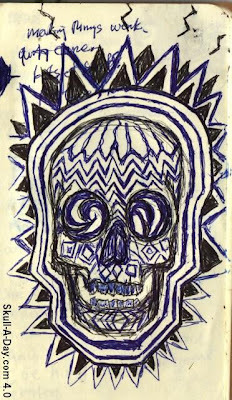 Emily S. Yates "wanted to share with you my newest contribution to The Mütter Museum Store and Mütter Day of the Dead celebration (10/30/10). 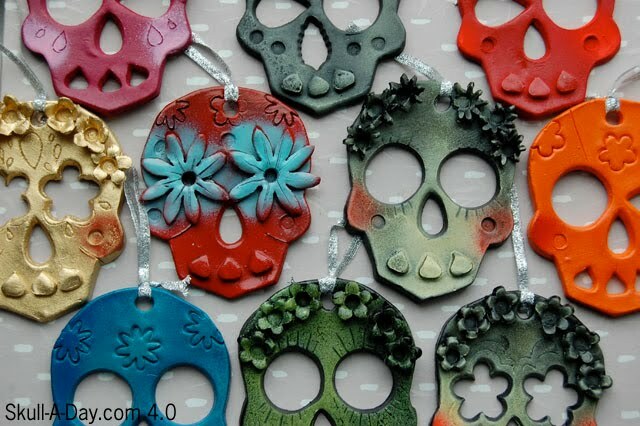 While recently working in my studio space at The Clay Studio, I've been developing small works of a decorative nature, influenced by both the holiday season & my macabre surroundings at The Mütter Museum - mainly ceramic skull ornaments. These colorful & flowery ornaments are reminiscent of sugar skulls used in the celebration Day of the Dead." I saved these until now to share, as I though they would also make pretty winter holiday ornaments. 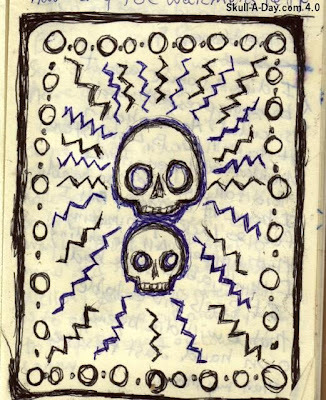 I like the stylized skull shapes. The use of additional clay details and impression details is neat. They add texture and interest. The different colored glazes are used beautifully to accentuate those details. 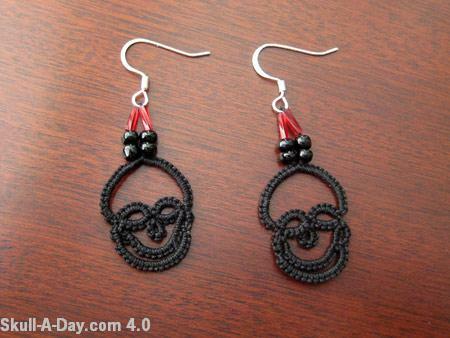 These pieces are available for purchase through Emily's shop, Ma'amamics. 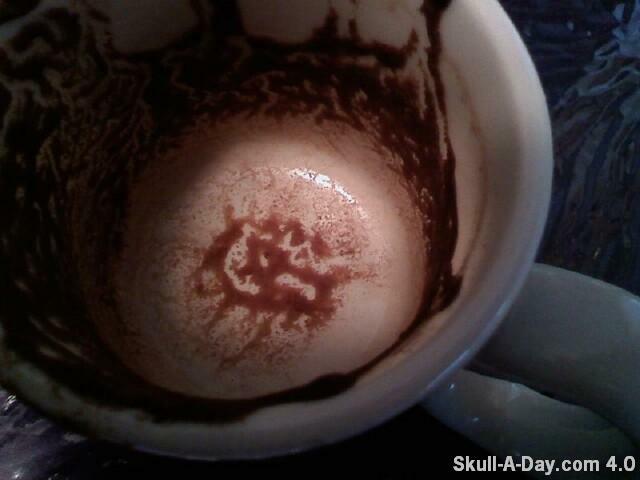 Today, we have some fine examples of skulls found in a drink and food. 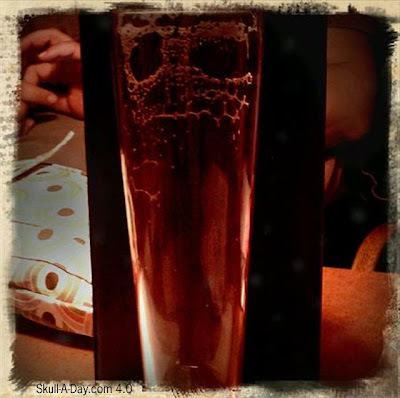 Such great examples, that I'm going to have to start hunting for more skulls in what I drink and eat. Julia Orloff from Bellingham, Washington said, "This appeared after finishing my Boundary Bay Scotch Ale. The finest brew in town!" I think a skull brew would have to be the finest one in town. Maybe one day, I will have one. Dave Chimp from Berlin, said "My girlfriend Flavie was preparing dinner tonight (peppers and chicken with lemon, followed by a raspberry cheesecake - my girlfriend rules!) 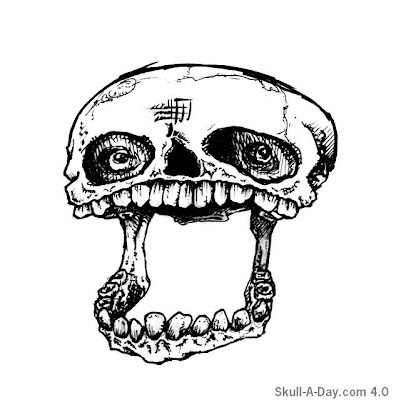 when I saw this beauty of a grinning skull. 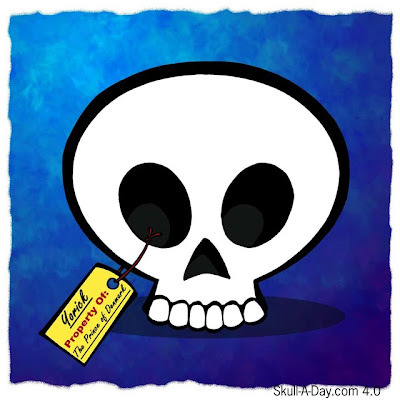 Of course I thought of Skull-A-Day." 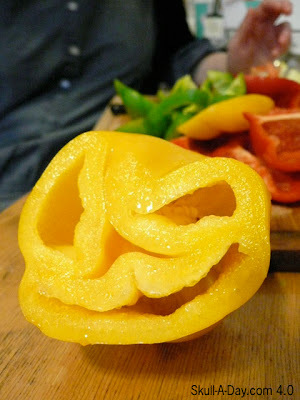 I'm glad you thought of us to share this sinister pepper with. That is a great meal. Your girlfriend does rule! 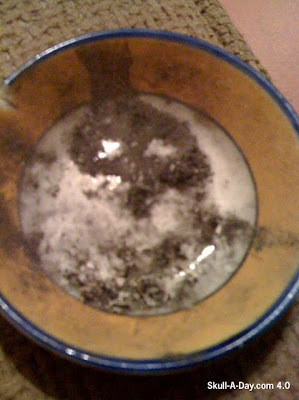 Jonathan from Verona in Italy, found this skull in swiss cheese. Swiss cheese is both flavorful and neat to see what shapes the bubbles form. 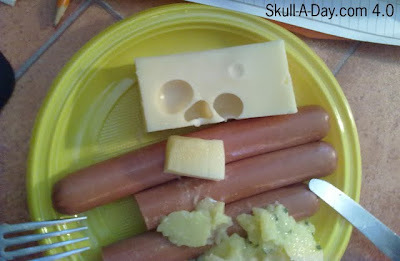 I'm going to have to start searching for skull shapes in the swiss cheese I eat. These aren't your typical skull loving bikers here. Enrique from Spain is on a race to show us his team's skullriffic cycling uiniforms. 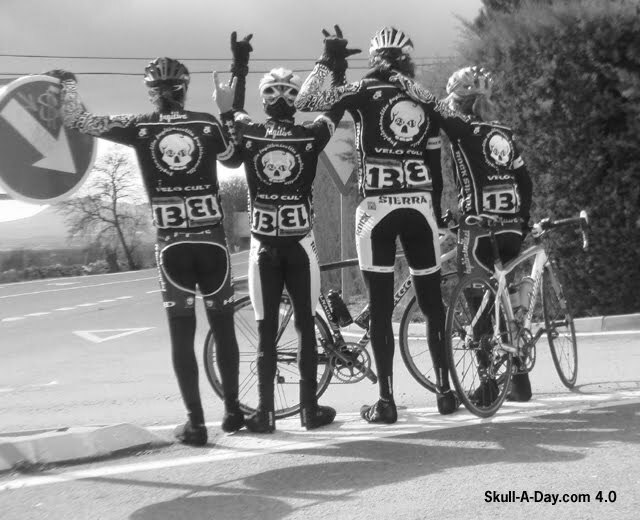 He's a loyal Skull-A-Day reader and admits that our site was a major influence on his team's outfits. I'm not big into cycling, especially since I don't look very good in spandex, but I'd make an exception just to join Enrique's team for a day. It's totally fitting that they wear the number 13 for their team as well. Maybe the other teams think twice before passing them? Maybe not, but either way they probably get the most "devil horn" salutes from other bikers. 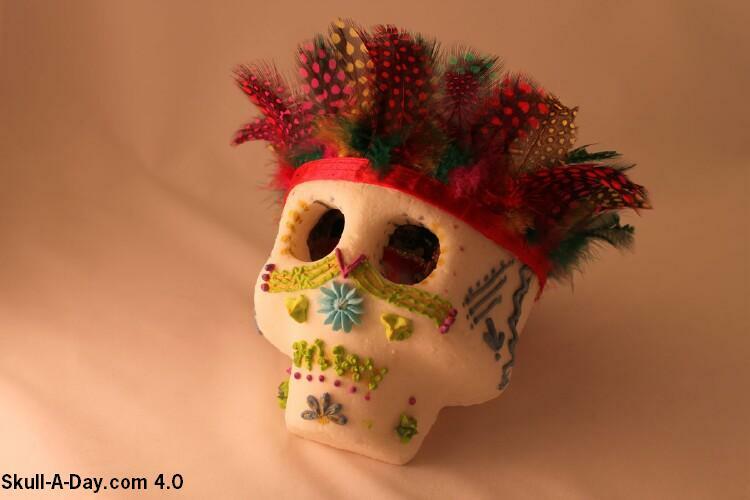 May all of your races be swift, Enrique, and may the skulls you wear help lead you to victory! 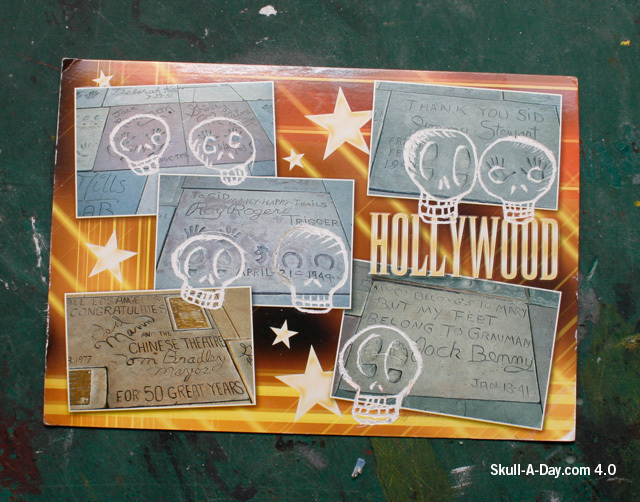 Several of my original Skull-A-Day pieces & photos will be featured in the Small Works group show at Krause Gallery on Orchard Street in the Lower East Side in December. The show, which features work by a range of artists represented by the gallery, examples of which are shown above, runs December 2nd thorough 30th and there will be an opening reception on December 2nd from 6-9pm. If you're in the area I hope you'll swing by and check it out. p.s. Krause Gallery is now representing my work in NYC and will also be doing a larger show of my work in May of 2011. I'll post more details on that show as it gets closer. I chose this one for two reasons. One, yesterday was Thanksgiving, so this reminds me of the many turkeys that were consumed yesterday. 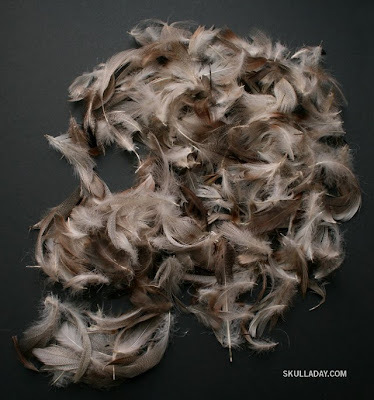 A feather skull, seems appropriate. 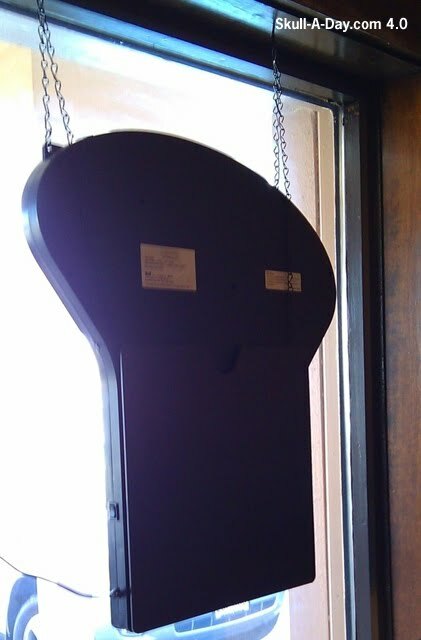 The other reason is that simply it's a beautiful and delicate piece. Feathers are temperamental to work with. I make fascinators and other hair accesories, where I use feathers. You might have lots of down on you when you are done, but you also have a beautiful delicate piece to be proud of. I like how Noah used the natural curves of the feathers to shape the skull details in the face. 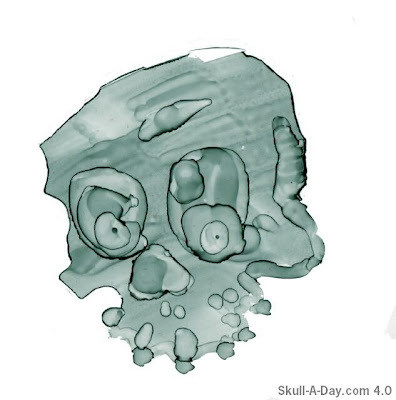 The side and back of the skull have a lumpy texture, but I've never seen a smooth skull, so this works well too. I have the sudden urge to break out the messy feathers and make more hair accessories. It's like Hermes for your head. I freakin’ love your work. My favorites have to be the India ink on acetate, there is such a wonderful spectral quality about them, that reminds me of work that may have appeared in one of the Vertigo Comic titles in the early 90s. Thank you for submitting your work for us to share. I figured since today is Thanksgiving in the US, where I live, that I would make one of my favorite dishes. Of course, it needed a skull modification. 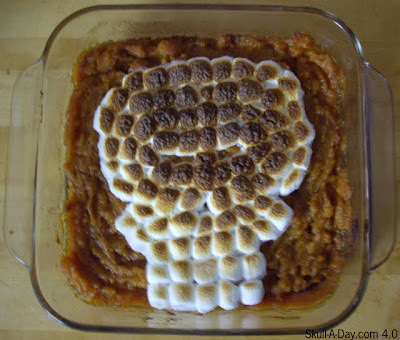 If you can't tell by the photo, toasted marshmallows on top of pureed yams (sweet potatoes) is my favorite Thanksgiving dish. Though Thanksgiving is about more than the food, that is a large part of the celebration. I actually made this yesterday for a small meal with my husband and daughter. We have been a family for many years, but have yet to have a Thanksgiving style meal with just the three of us. I thought we were in need of a change and a new tradition. To find out how we made this dish, read the tutorial. If you don't like yams, this is something you can try on other foods, like brownies...which I might attempt later today. Have a great Thanksgiving all! John Thomas Pusateri sent us three pieces from his recently hand-drawn stone lithographic series, "Skin and Bone". 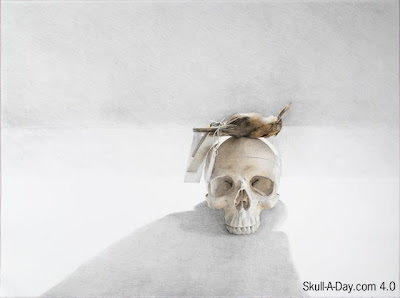 I like the eerie and anatomical qualities to birds and skulls. The use of shading and color nicely captures the detail of the subjects. I like that the birds have multiple tags hanging on them. This reminds me of the toe tags that corpses have in morgues. I'm curious as to what kind of birds are depicted. Birds are some of the more delicate creatures. It's neat to see them used in scenes of death. These are all fascinating pieces. Great work! No thanks needed its what we do. However, thank you for taking the time to submit this body of work to us, we love seeing the work that you do, and we also love knowing that our fans are aging with us as the years click by one Skull-A-Day at at time. 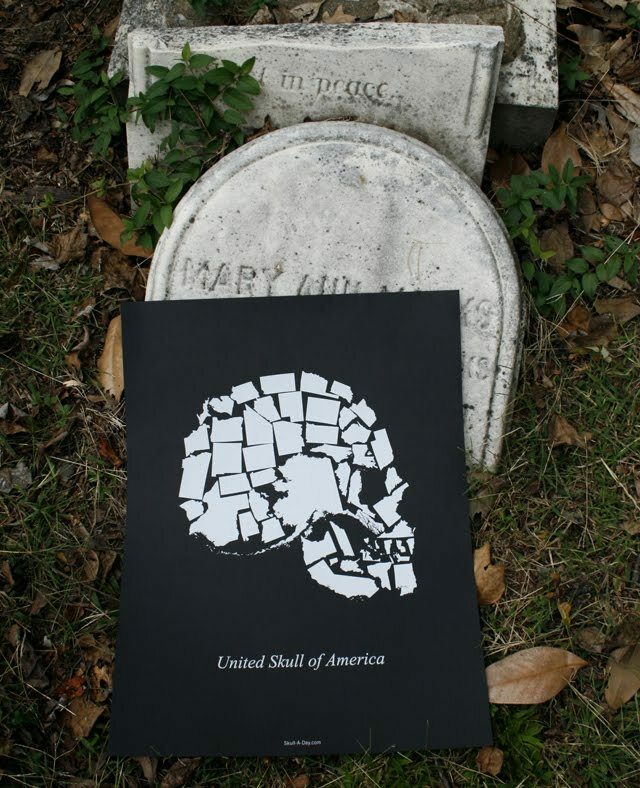 Get a United Skull of America T-Shirt for anyone with a body! Buy a United Skull of America Poster for anyone with a wall! 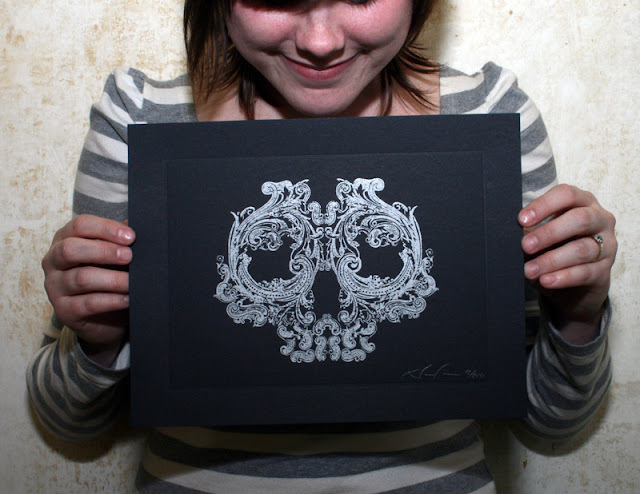 Order an Ornamental Skull Print for anyone with a smaller wall! 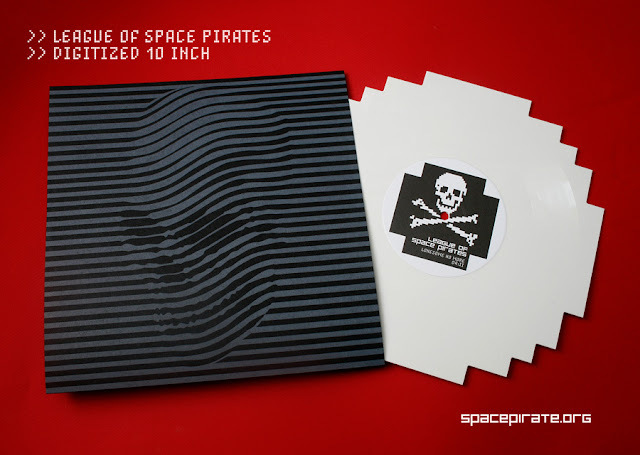 Purchase a League of Space Pirates Record with Skulledelic print for anyone who has ears! Obtain a Skull-Appreciation-Day Button for anyone without one! Or get 6 for the price of 5 if you have more than one friend! 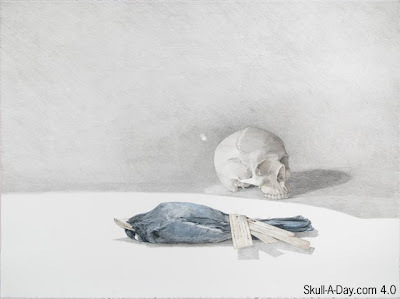 Elkayem was inspired by the Agents Of Oblivion album to paint this skull and write this bit of free verse. The dark messages of the doom metal must have been a major persuasion for the infernal-ish background. The realistic details add to the gruesomeness. 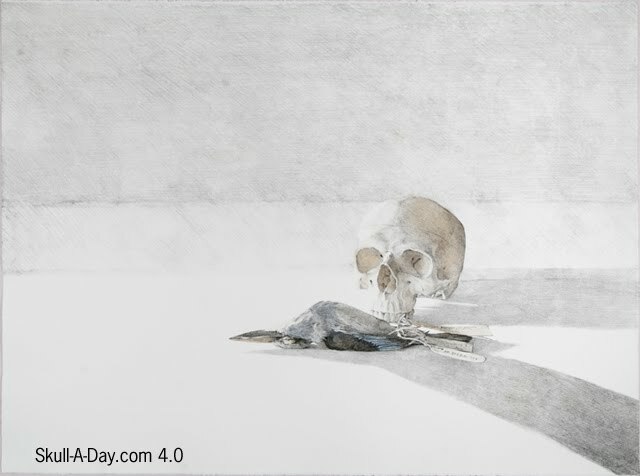 Perhaps this painting, along with metal music, is a grim reminder of how our skulls end up. 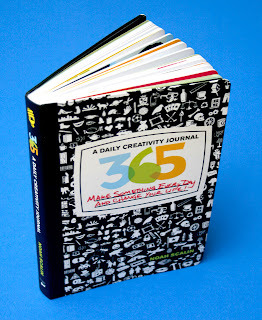 Perhaps it's a good reminder to enjoy each day and make them your own. Thanks, Elkayem! Raymond Betancourt is a cartoonist and wanted to share one of his pieces, entitled "Yorick", with us. I love cartoons. I might be an adult, but I still watch them...even as I'm writing this post. For this cartoon, I like the shape of the skull, the colors and shading. The tag is amusing. 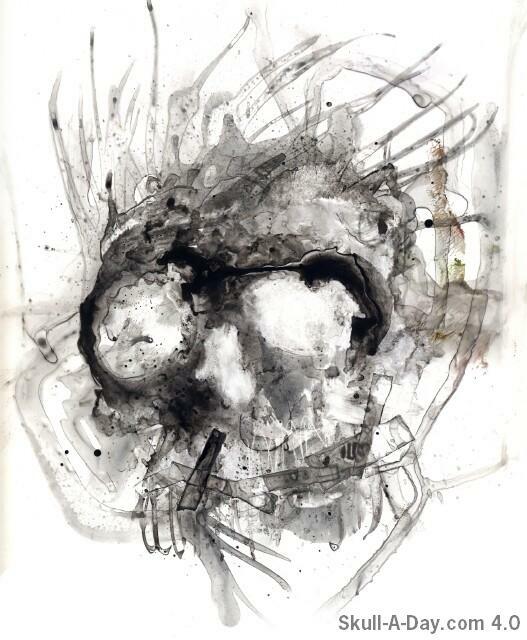 Of course, Yorick comes from Shakespeare's "Hamlet". I remember reading the play many years ago. So long ago, I forgot who he was. So, I looked him up. Yorick was a deceased court jester, which makes the use of his skull in cartoon form, very appropriate. 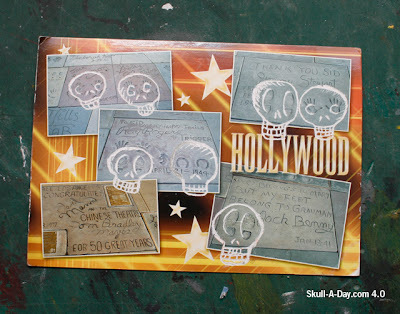 Sunday is here again and the skull hunters have been at it again. I gotta "hand" it to Jana Schloesser of Phoenix, AZ. for finding this one. "This picture is of my beautiful wifes hand. 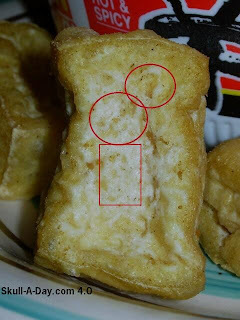 She has light colored patches of skin on her hands and this one looks like a skull." C.D. 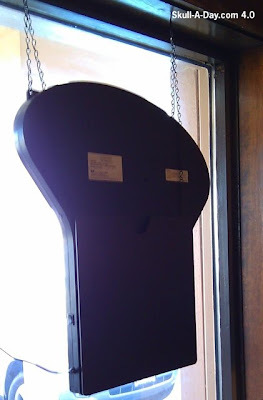 Ellefson saw this Punisher style skull formed on the backside of an open sign at a Japanese Restaurant. "It has wonky square eyes, a nose, and best of all, it was hanging from chains." And lastly, the Barold found a skull in a ramekin that is used as an ashtray. 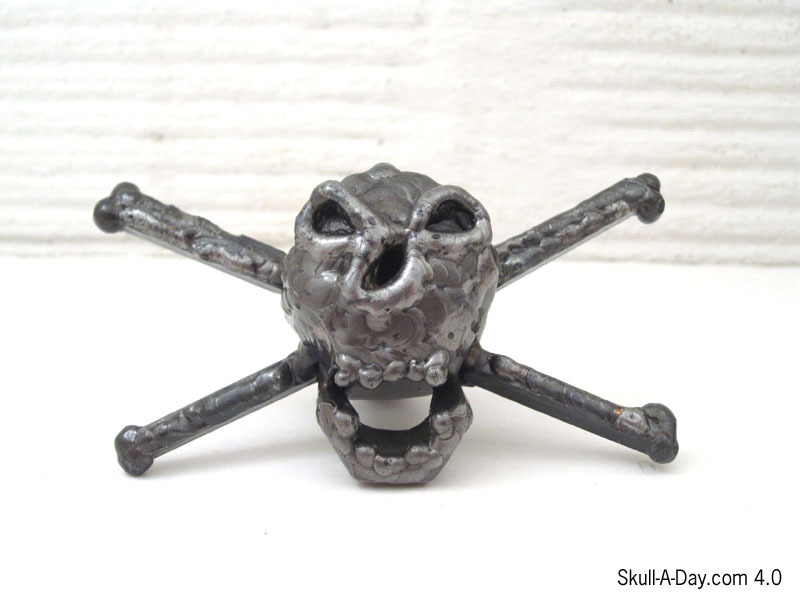 Thanks again to all of you skull hunters who keep the hunt alive and keep our Sundays filled with hidden skulls. If you have the chance to catch one of your own then please submit it so we can share your catch with all of our readers. 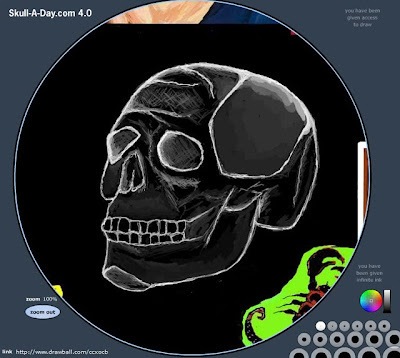 Today's skullfitti comes from Donna who writes, " I drew this on Drawball.com The huge ball of graffiti, where people from all over the world can draw!" Thanks for sharing the nifty skull, Donna. I've never seen or heard of Drawball.com before today, but it seems like an awesome place for ceative minds to display their talents. 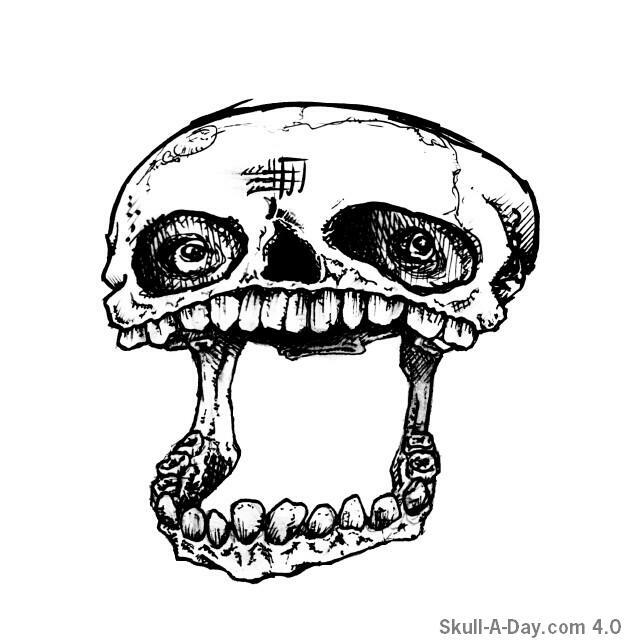 Kind of like Skull-A-Day. 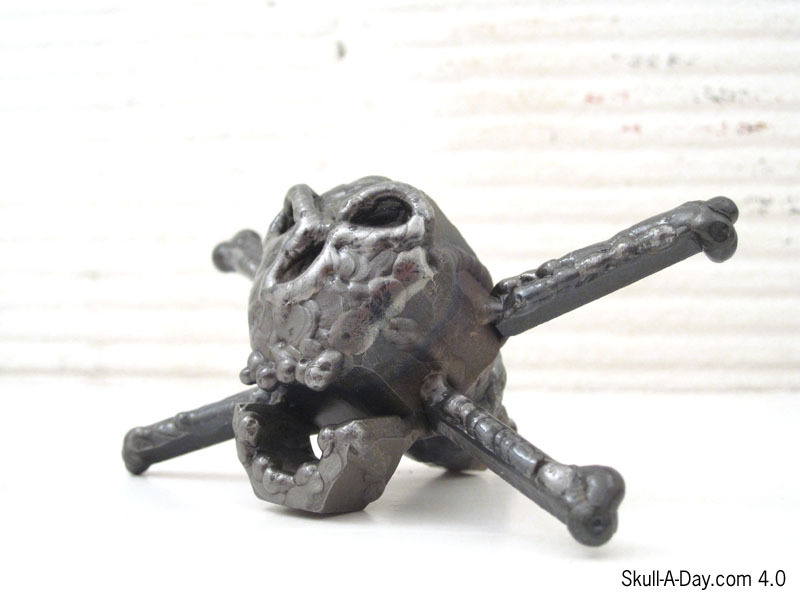 I wonder if there are any more Drawball fanatics out there who like to dish out some skullfitti? Anyone??? Author Kate Heyhoe told us: “ ‘Dreams of the Dead’ turn traditional sugar skulls on their heads.” She makes hollow sugar skulls, then fills them with panoramic interior “skullscapes,” lit by LED lights, and sculpts exterior details out of sugar-paste, then airbrushes or hand-paints them using food colors and nontoxic paints. They’re not meant for eating, and are preserved with a clear moisture- and UV-resistant coating. “My skulls undergo 20+ stages in their creation. 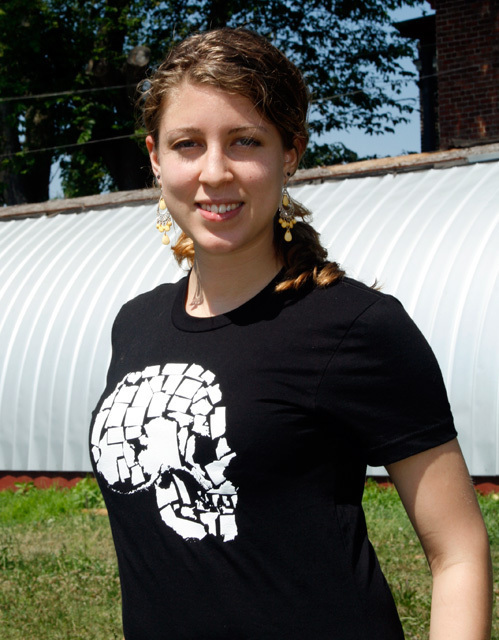 They range from near-human to walnut sizes, and no two skulls are exactly alike,” she says. Her work is featured at Mexic-Arte Museum, Authenticity Gallery and Yard Dog Gallery in Austin, TX. “Dreams of the Dead” group shot, lit – Assorted skulls from ping-pong size to melon size. Fine Young Cannibal - Lit by a battery-operated LED, about 5-inches cubed. Big Jules (Steampunk Series) - Lit by a battery-operated LED, about 5-inches cubed. 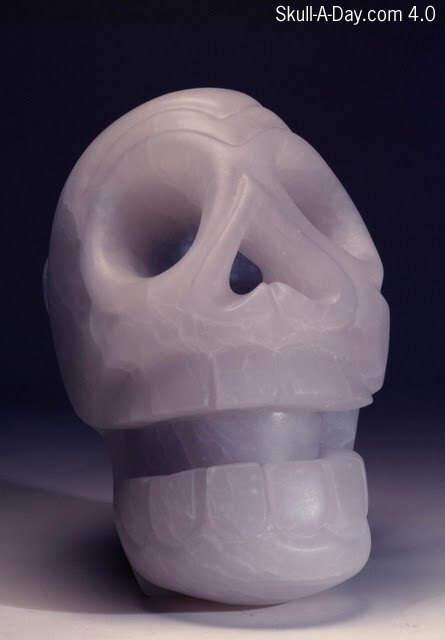 Lost at Sea (Grande Nightlight Skull) - a plug in nightlight; skull is 3/4 the size of a human skull. Although these are not edible, Today was truly a treat for us all. This is amazing work both in the creation of the skull and the ultimate finishing of the pieces. Thank you for submitting your work for us to share. 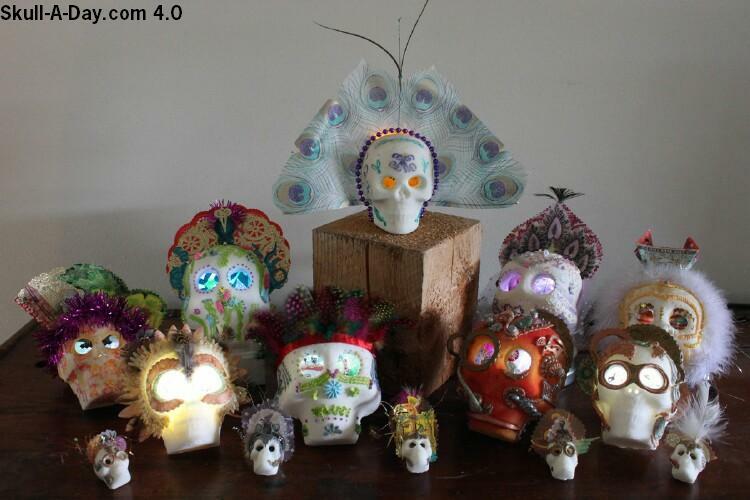 Readers: Make sure you check out Kate’s link above for more on these remarkable skulls. 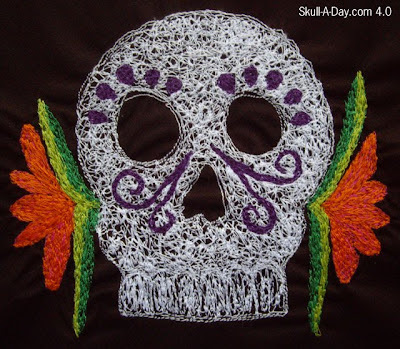 I wanted to challenge myself with this one, by finding a way to combine my love of sugar skulls with embroidery and machine sewing. This is my first attempt at free-form machine embroidery. It's not perfect, but overall, I'm happy with it. 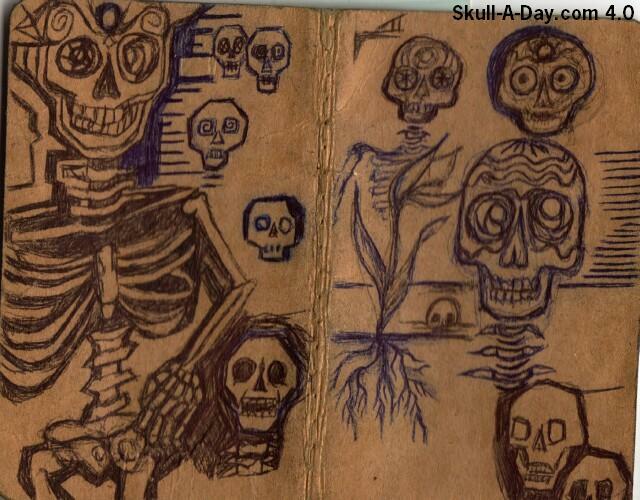 This was also spawned by a curiosity of how Noah could have done this skull and this skull. I think we did our different, as I used a special foot for the machine and lowered the feed dogs of the machine. 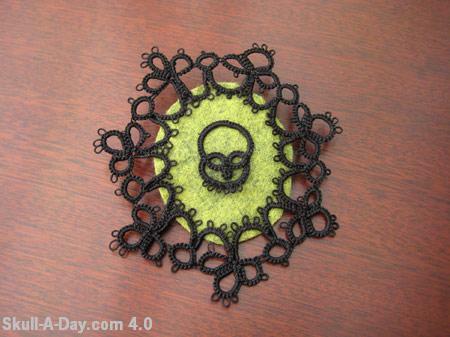 For more information on how I made this piece, go to the tutorial. 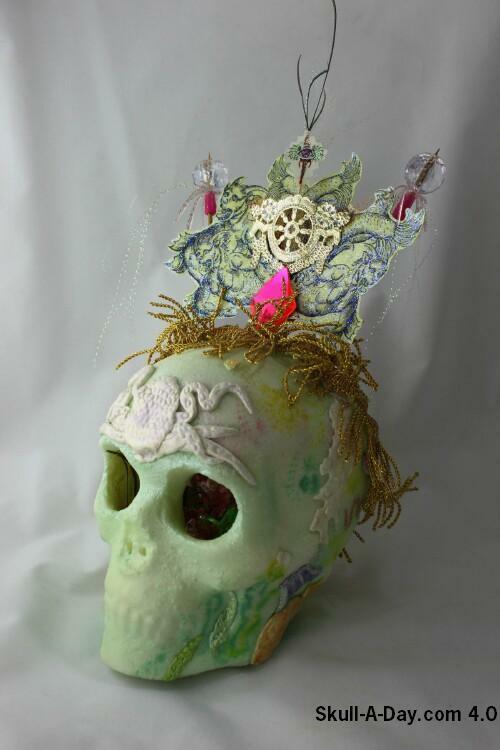 Cat Quintanilla created this skull, entitled "Cenote" out of Italian Blue Ice Alabaster. I will let her explain her piece. "Cenote, an homage carving to honor my father who after a long and colorful life passed away on Dia de los Muertos a few years ago. 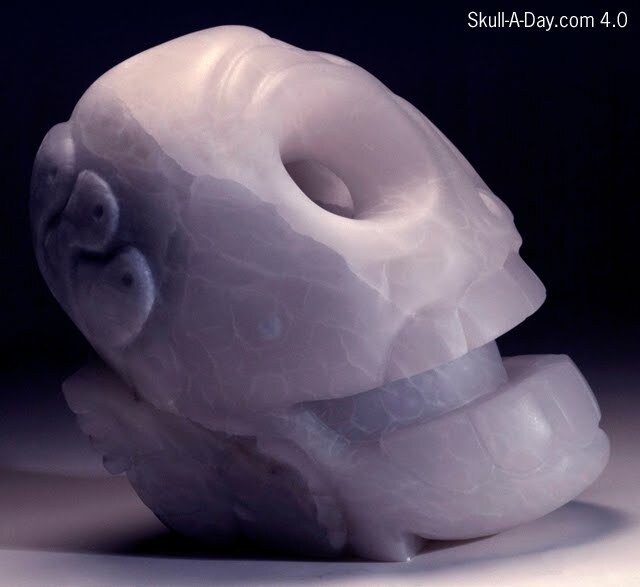 In this Calavera carving, focus is on the cavernous orbitals with positioning of the deep blue blush of the natural stone. 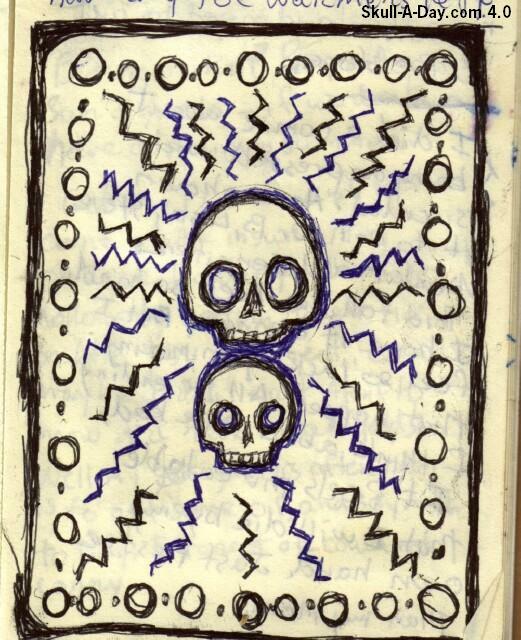 Abstractions of pre-Colombian glyphs wrap the skull back and sides. The cenotes of Mexico and other places on the planet have served as magical sources of life giving water." First, this piece is amazingly beautiful. I love the use of detail while being mindful to the natural colors of the stone. I don't know much about cenotes, but I like that the blue color was incorporated by the choice of stone. The natural lines of the stone also remind me of water. They also remind me cracks in ice. Second, I love that this was made in honor her father who passed away on Dia de los Muertos. Making art is a great way to honor a deceased love one, in a beautiful way. Fiber Arts are an area of art that still puts me in awe. You truly have talents that not everyone posses. I know these were not made for this purpose, but when I saw these pieces I was reminded of 19th century Mourning Jewelry. 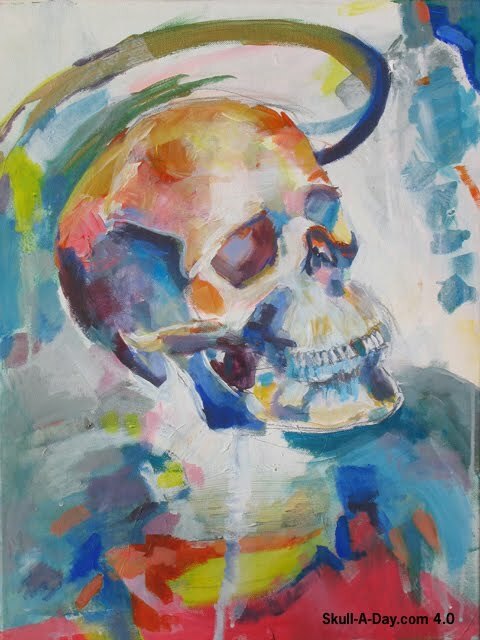 Granted the imagery of the skull would probably never have been used during that period, still as history moves along so to how we interpret things to meet our present needs so why couldn’t these be modern interpretations of the past. Thank You for submitting your excellent work, and I look forward to seeing more of it in the future. Now I need to get to work with the second card she sent me. 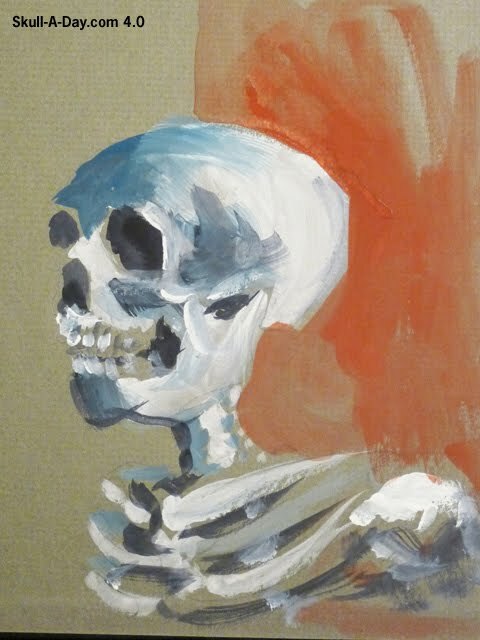 The process is a great way to get some art and stay inspired. 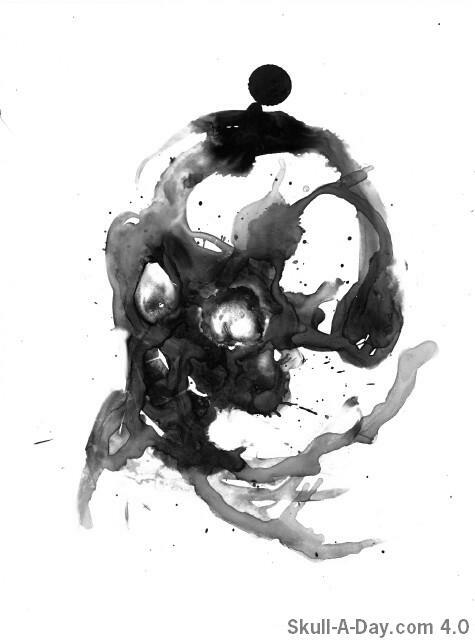 Why not give it a try and if you make some skull art in the process of course please share it with us! In case you've never had the pleasure of meeting Tom Sale, aka Pinky Diablo, you can see some of his past work here and here. For today you can check out this small painting on a book cover that he did for a show in Dallas, TX. 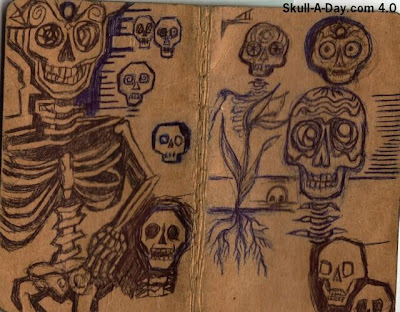 Just like the story in a book emerges from the pages and takes shape in yor mind, this skeleton seems to be coming forth from a dark place with a story of it's own. Is the dull red background the seedy lair of an undead skeleton's torturous chambers, or perhaps it's the top of the stairs leading down to Hades inferno? Either way this skeleton looks like it has a story to tell and we're all glad you decided to share it with us, Tom. Thanks again! 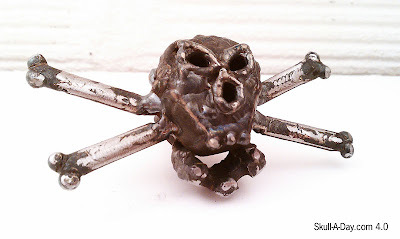 Josh Welton from Brown Dog Welding and Year of the Chopper, returns with these skulls that are on a couple of the drawer handles on his tool box. I love seeing metalwork. It's one of the few arts that I have no experience in, so it intrigues me. These particular pieces are both practical as draw pulls and decorative as they are hand made skulls. I like the irregularities that this work has, it shows that they are one of a kind pieces verses commercially made, cast pieces. Since I'm working on some Christmas crafts for friends, I was thinking of how neat these would be as Christmas decorations or jewelry. Once again, Josh has shown us some great pieces of his work. A little bit of Simulacra sustenance for you this week. 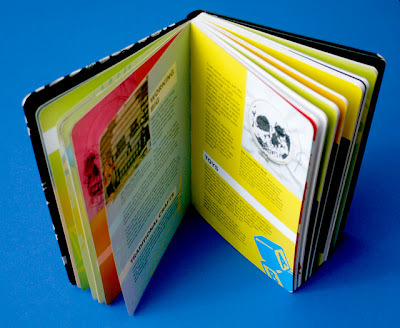 This is an excellent collection of simulacra that we can add to the ever growing collection. Christina, don't worry it was just telling you that one was finished and you needed a refill. LF, potato salad, IMHO, is always evil this just proves it. Sharkie, thanks for stumbling upon us. 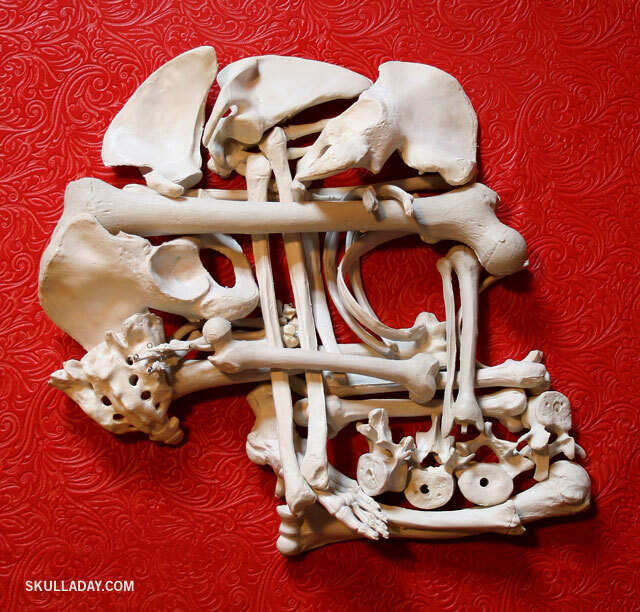 You have already caught the simulacra bug, don't worry it is not fatal it just looks that way.